10 A None No Power Seat 10 A is a standard Premium Economy Class seat however, the proximity to the lavatories and galleys may be bothersome. There is no floor storage for this seat during takeoff and landing. 10 C None No Power Seat 10 C is a standard Premium Economy Class seat however, the proximity to the lavatories and galleys may be bothersome. There is no floor storage for this seat during takeoff and landing. 10 D None No Power Seat 10 D is a standard Premium Economy Class seat however, the proximity to the lavatories and galleys may be bothersome. There is no floor storage for this seat during takeoff and landing. 10 E None No Power Seat 10 E is a standard Premium Economy Class seat however, the proximity to the lavatories and galleys may be bothersome. There is no floor storage for this seat during takeoff and landing. 10 G None No Power Seat 10 G is a standard Premium Economy Class seat however, the proximity to the lavatories and galleys may be bothersome. There is no floor storage for this seat during takeoff and landing. 10 H None No Power Seat 10 H is a standard Premium Economy Class seat however, the proximity to the lavatories and galleys may be bothersome. There is no floor storage for this seat during takeoff and landing. 10 K None No Power Seat 10 K is a standard Premium Economy Class seat however, the proximity to the lavatories and galleys may be bothersome. There is no floor storage for this seat during takeoff and landing. 14 A None No Power Seat 14 A is a standard Premium Economy Class seat that is missing a window. 14 K None No Power Seat 14 K is a standard Premium Economy Class seat that is missing a window. 16 A None No Power Seat 16 A is a standard Economy Class seat that may have some extra legroom due to the position of the bulkhead. The tray table is in the armrest, making the armrests immovable and slightly reducing seat width. There is no floor storage for this seat during takeoff and landing. 16 C None No Power Seat 16 C is a standard Economy Class seat that may have some extra legroom due to the position of the bulkhead. The tray table is in the armrest, making the armrests immovable and slightly reducing seat width. There is no floor storage for this seat during takeoff and landing. 16 D None No Power Seat 16 D is a standard Economy Class seat that may have some extra legroom due to the position of the bulkhead. The tray table is in the armrest, making the armrests immovable and slightly reducing seat width. There is no floor storage for this seat during takeoff and landing. 16 E None No Power Seat 16 E is a standard Economy Class seat that may have some extra legroom due to the position of the bulkhead. The tray table is in the armrest, making the armrests immovable and slightly reducing seat width. There is no floor storage for this seat during takeoff and landing. 16 G None No Power Seat 16 G is a standard Economy Class seat that may have some extra legroom due to the position of the bulkhead. The tray table is in the armrest, making the armrests immovable and slightly reducing seat width. There is no floor storage for this seat during takeoff and landing. 16 H None No Power Seat 16 H is a standard Economy Class seat that may have some extra legroom due to the position of the bulkhead. The tray table is in the armrest, making the armrests immovable and slightly reducing seat width. There is no floor storage for this seat during takeoff and landing. 16 K None No Power Seat 16 K is a standard Economy Class seat that may have some extra legroom due to the position of the bulkhead. The tray table is in the armrest, making the armrests immovable and slightly reducing seat width. There is no floor storage for this seat during takeoff and landing. 27 A None No Power Seat 27 A is a standard Economy Class seat that has limited recline. The proximity to the lavatories may be bothersome. 27 C None No Power Seat 27 C is a standard Economy Class seat that has limited recline. The proximity to the lavatories may be bothersome. 27 D None No Power Seat 27 D is a standard Economy Class seat that has limited recline. The proximity to the lavatories may be bothersome. 27 E None No Power Seat 27 E is a standard Economy Class seat that has limited recline. The proximity to the lavatories may be bothersome. 27 F None No Power Seat 27 F is a standard Economy Class seat that has limited recline. The proximity to the lavatories may be bothersome. 27 G None No Power Seat 27 G is a standard Economy Class seat that has limited recline. The proximity to the lavatories may be bothersome. 27 H None No Power Seat 27 H is a standard Economy Class seat that has limited recline. The proximity to the lavatories may be bothersome. 27 K None No Power Seat 27 K is a standard Economy Class seat that has limited recline. The proximity to the lavatories may be bothersome. This Lufthansa Airbus 340-300 is operated in a three class configuration with 30 angled flat bed Business Class seats, 28 Premium Economy seats, and 221 standard Economy seats. Note that seat 32A on this particular plane has two video boxes under the seat. This means there is practically no room for any bags at all on this seat -- and very little room to stretch your legs either. Not all window seats have both video boxes under the same seat like this one. But this particular seat did and it made things very tight. 18D, 18E, 18F, & 18G all have the tray in the armrest reducing the seat width. In addition the misalignment of the row in front makes the use of the entertainment system awkward since it is at an angle. Row 16 ist perfect for extra leg room and the front row is very far away (my hight 6,7). Also the back of the seat is flexible an you can lean backwards. No serving or dishes, bathroom area near by. Comfortable seat, terrible food, bad customer service. In other words, the usual LH experience. Meals identical to coach, just served on china. Two rate Germans were bumped from biz into PE, and were hassling the flights attendants about this. Crying baby rounded out the PE experience. Frankfurt airport was a nightmare as usual. LH's customer call center was also terrible as always - it took three calls to make a date change. LH's Premium Economy product is one of the best out there. This was my third time flying PE, and like another user said, it looks/feels like old business seats from the 90's so it is not bad at all. 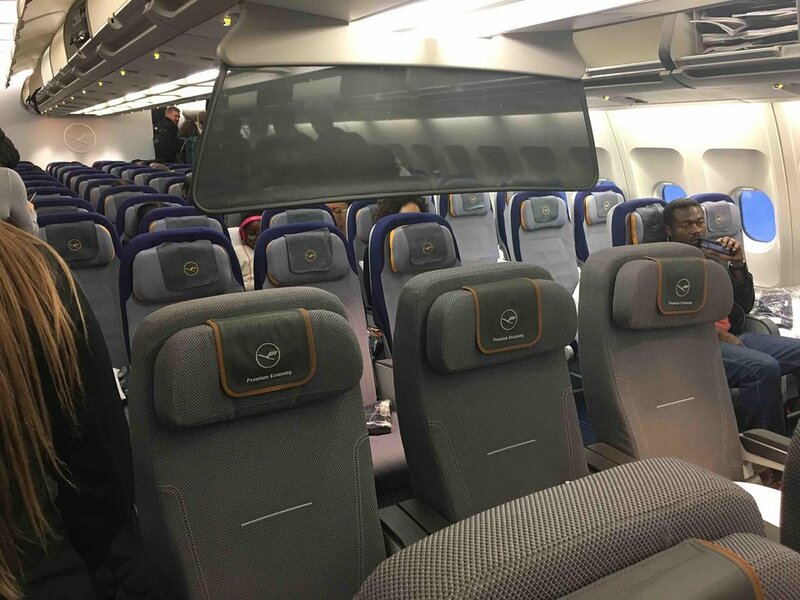 In fact, the PE seats in LH are nearly the same used in business class in narrow-body aircraft in Latin America. The service is amazing. Even if you have somebody sitting next to you, you do not feel it. I always sit in the mid-section so I never need to get up to let somebody go to the bathroom. Let them call the person on the other side. This plane had its own PE cabin with the toilets right behind it. But another plane without an exclusive cabin also flies this route. Avoid seats 18E and 18F! And beware of 18D and 18D unless you need special aisle access. All of the middle four seats in row 18 (D,E,F,G) have impaired leg room because the row in front of them only has 3 seats and the rows are staggered and do not line up. This means each seat in row 18 has the seat supports from row 17 in the way of their feet. On the end seats, 18D and 18G, this could be an advantage, because there is some extra aisle space in front of you to the side. My wife picked one 18D because of her injured left leg and this let her stretch it out. The staggered seats in front also mean that you must share screens because there are only 3 screens in from the the four seas, and they are off center. Also the arm rests are extra wide (for pull out trays) and do not fold up for the center seats of row 18 and make the seats narrower. LH have a curtain to keep it quiet and private. Much better than AC Premium Economy. Food was good as was the service. Only really bad thing is the LH have contracted out the gate and checkin and the service is nowhere near LH standard you see in Europe. I was actually in 30K and thankful as I noticed that the leg room at 30H is further restricted due to the proximity of the crew members seat and their legs, although the crew member used it only during takeoff and landing on my flight. I suspect the same is true for seat 30C. There is no problem with the seats, they decline just as any normal seat. Good service. Very good WIFI connection on board. Beware of 16D. Although there is plenty legroom, the seat is quite small as the tv and tray are both in the seat. If you are a bigger person I wouldn't recommend at all. Not so good, given limited space for feet as this is in front of the wall that separates business class from premium economy. Also, the flight screen is annoying given the proximity and light. The row of middle seats in business class should be marked yellow, due to the inconvenience of being the "sandwiched" The exclusive toilet for the staff at the front is not nice. I was not allowed to use it despite the two at the back meant for passengers being occupied! Flew this plane DUS-ORD. The galley in front of the plane did not bother me at all, the seat was quite private due to the fact that its first row. Also nobody sat next to me. It was a very pleasant flight, good service, good food. THERE IS NO BULKHEAD!Nor are any of the other seats in this row. There is just an eye level screen separating it form Premium Economy. There is masses of legroom to stretch out, much more than a "bulkhead" seat, and it is well worth the £50+ to reserve it, if you have long legs. Also this is not an emergency exit, so there is no age or fitness requirement. The row 14 (14A/B) and 14H/K) doesn´t have windows. Perfect if you want to sleep, not good if you want to look outside. Middle seats (D and G) in business class have a quite narrow foot rest (except for row 1). This might be inconvenient for tall people (> 180cm). Apart from this observation, LH fulfilled all my expectations. 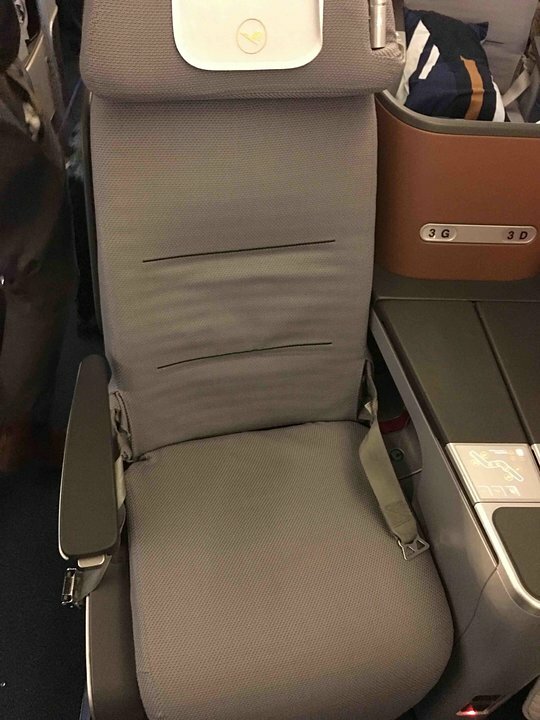 Nice new Premium Economy. 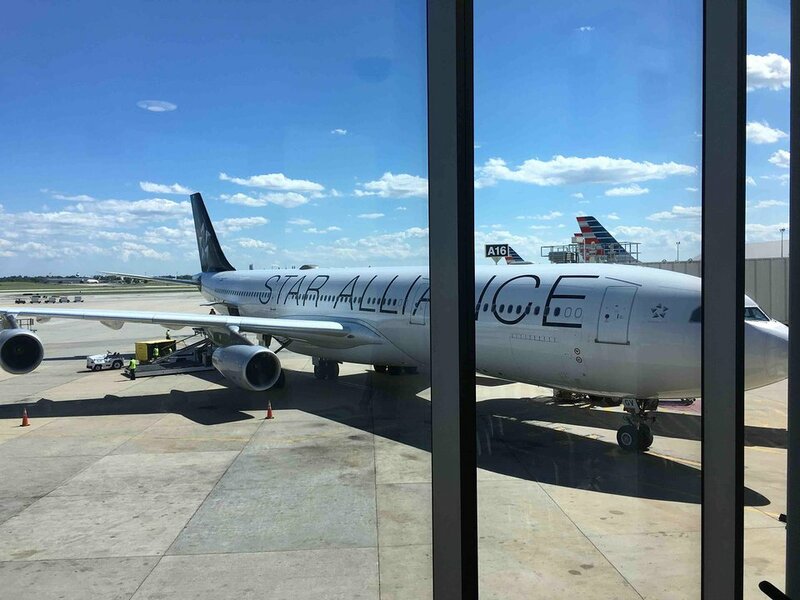 Comfortable seat, very friendly service and a good price for a nearly 13h flight. Definitely worth the extra money when comparing it with standard economy. All seats in row 27 have a limited recline. Been sitting there, it was clearly visible that the seats do not recline as far, as the other seats. Valid for all 8 seats. Very uncomfortable business seat, tight, no footrest - the new Lufthansa equipment. I could not sleep well because the seat was one of these weird angle-flats - I ended up half-sitting. The touchpad for the seat control worked nearly as bad as the extremely annoying new remote control for the screen. Whoever developed these devices should be FIRED! Again, I passed on watching a movie. Also very annoying: the restroom in front was exclusively used by the crew, all business passengers had to share two - extremely tiny and obviously economy-class-equipped - restrooms in the back. One of my worst business flights ever!